Of all the books that I have on my reading list, this was the one that I had most trepidation about starting. There was the inevitable concern that the controversy about it and the possibility that it would eclipse whatever actual merit the book would contain. But, as I had received the book as part of a larger bundle of audiobooks, it seemed a bit of a waste to just leave it languishing on my computer unread. The fact that my attempts to listen to it on my tablet made it sound like Alvin and the Chipmunks were narrating did somewhat mar the experience too. The Satanic Verses follows two Indian actors who miraculously survive the explosion of a hijacked plane over the English Channel, and the strange changes that come over them following this. First there is the popular Bollywood star Gibreel Farishta chasing after a lost love, who finds himself taking on the personality and divine powers of the archangel Gibreel. The other is Saladin Chamcha, a long-time resident of London returning from an unsuccessful reunion with his father, who takes on the rather more unfortunate shape of a satyr-like devil. Interspersed in their narratives about their lives after these unusual and distressing changes, are dreams that Farishta has about events in his celestial persona's past. First is the sequence starting with the episode of the Satanic verses. Second is a sequence focusing on a modern day Imam in exile. Third is a sequence following a seer named Ayesha, who convinces her village to go on a foot pilgrimage to Mecca, claiming that she will invoke God's will and part the sea for them to reach their destination. Before I continue onto the review properly, there is something that I feel should tackle, if only briefly, lest it become an elephant in the room. I've been able to find out the basics of why The Satanic Verses was so controversial with some Islamic readers, mostly in response to the dream sequence about the Satanic verses themselves. And while I can definitely understand that some of the imagery and allegorical naming would be considered incendiary, I won't pretend to know enough in the realm of religious scholarship to comment too deeply on them. In addition, I would rather not start up a discussion about free speech here, because it is a complex subject that I would only be able to scratch the surface of. All I suppose I would commit to here is that while I am all for people facing up to the consequences of their proclamations, it is a step too far to try and kill someone for those statements. Right then, so onto the actual book. The Satanic Verses is an ambitious work focusing primarily on the immigrant experience in Thatcher-era Britain, and the strict divide between white and non-white cultures. Chamcha's insistence throughout the majority of the book to model himself off of the ideal aristocratic, stiff-upper-lip style of Englishman, only becomes more pathetic and futile as the narrative goes on and he finds that London has retained all of the smugness inherent in conquerors but none of the sophistication. Similarly, Farishta's increasingly unhinged attempts to mold London to his city of ideals only ends with disillusionment. The book does a lot of clever things to create multiple, interconnecting stories of isolation and the conflict between being unyielding and maintaining one's cultural identity vs compromise and changing to suit your new culture. It does a lot of interesting things, but still I find myself quite content to never re-read this book. I think I may have a similar reaction to Salman Rushdie that I do to Gabriel Garcia Marquez: the books they write may be very clever and worthy of study, but it does nothing for me emotionally. 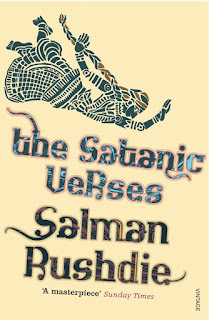 The Satanic Verses is a book that, were I still in university, I would be quite happy to study and analyse to death, but I very much doubt that I will revisit it for reasons of pleasure. This is a matter of personal taste though, and I do wonder whether I would have been more forgiving if I had been allowed to tackle the text at my own pace instead of in the irregular intervals where it would be appropriate to be anti-social for hours at a time.